According to leadership expert Ram Charan, 70% of strategic failures are due not to a lack of smarts or vision, but to poor execution. That’s because no matter how well-crafted a strategy is, the leaders and individual contributors in the organization need to execute it. To help organizations better implement their strategies, Advantexe has developed an interactive business simulation called Leading Strategic Execution business simulation (LSE). Leading Strategic Execution™ is a two-round, digital business simulation in which participants align, communicate, motivate, and drive their direct and indirect teams to execute the organizational strategy in order to achieve revenue, growth, and profit targets. Participants assume the role of an Operations Manager for ABC, Inc and in this role must translate the CEO’s high level strategy into priority initiatives for their Business Unit and then lead their people to execute flawlessly. 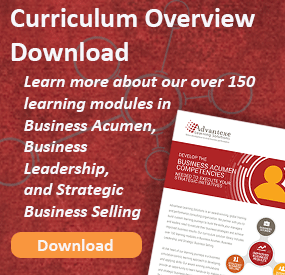 Faced with over 25 different business scenarios that are based on research of real-life situations, learners weave their way through an interactive story line that unfolds based upon the learner’s decisions. Learners react to events, interact with virtual colleagues, and directly respond to their teams challenges. The LSE simulation tool is designed for senior, middle and front-line leaders to help them understand how to see the big picture and lead through alignment, communication, and prioritization of initiatives. A standard version of the LSE business simulation is available through deployment on Advantexe’s learning portal. We can work with you to develop a customized version to your direct needs, situations, initiatives, and can even include scenarios directly effecting your company and industry. As part of the customization process, each decision of the simulation can be tied back to the behaviors and commitments of each of your desired organizational competencies and practices. To learn more about the Advantexe’s LSE simulation and business acumen training solutions, please contact Jim Brodo at james.brodo@advantexe.com. Learn More! Contact advantexe to learn more about our LSE simulation.